In this course, learn how to create websites without writing code. If you’re familiar with Adobe Photoshop, InDesign, or Illustrator, and you have an occasional need to build websites, Adobe Muse is for you. This course will show you the required steps to properly plan, design, and publish a site. From Master Pages, Headers, Footers, and everything in between, you’ll have the skills to quickly build a modern website based on web standards. Learn how to incorporate some of the latest web trends in design, including: parallax scrolling, JQuery slideshows, Google maps, social media, video, contact forms, and much more. When you are finished with this course, you’ll know the ins and outs of Adobe Muse and be ready to tackle cool, cutting edge, interactive web projects in Adobe Muse! We make our lessons very personal for our students to make them comfortable with the program. We work with your projects so you can advance in your work while learning Adobe muse. 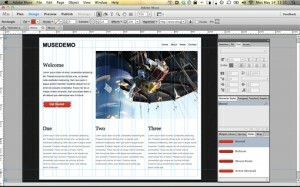 Adobe Muse training is a must to build a professional website.